I have always had straight and limp hair so it has likewise been a lifelong dream to have a thicker and full bodied hair. I find it hard for me to curl my hair on a daily basis just to make it appear thicker because of how humid it is where I live. Sure, there are hair treatments such as perming and Brazilian blowout to make my hair appear fuller but I find these procedures expensive and high maintenance because you have to regularly do them to maintain fullness of the hair. Not to mention, these procedures can be damaging in the long run because you expose your hair to unnecessary chemicals and heat. I found hope for my limp hair when I learned that there are quick and easy ways by which I could make my hair longer and fuller without any treatment and that is through hair weave and hair extensions. Hair weave and hair extensions have always been celebrities’ secret to what appears to us as fuller and healthy hair. I do not think they could have don their fabulous hairstyles without the use of hair extensions. The best thing about hair weave and hair extension nowadays is that they are now easily available for everyone. There are tons of these products online that we could avail of. Thus, we could easily get that celebrity-like thick and full hair with a simple trick, that is, through applying hair extensions ourselves. I have always believed that hair extensions are the quickest and the most uncomplicated way to get full hair. You just attach the hair weave at the back of your hair to make it longer and fuller. If you have a hair bundle with closure on the other hand, you just make use of the lace closure to hide your existing hair and sew or glue the bundles in place. 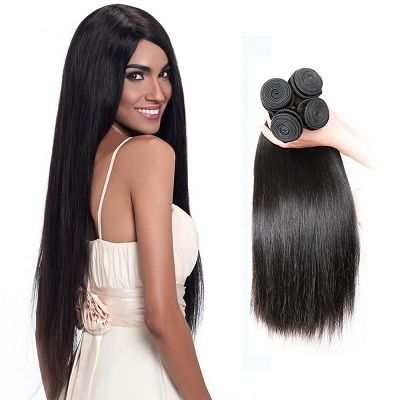 With the right amount of bundles, you could get the perfect amount of thickness and fullness that you are aiming for. Among hair weaves available in the market, the best ones are Brazilian hair. They are made of human hair so they look and feel absolutely natural. They are not treated at all so you could make use of them, by dyeing or perming, as you please. Not only are they sure to give you that gorgeous and full bodied hair you have been aiming for, these hair weaves can do so in the most natural way possible. There are tons of options available when it comes to choosing hair weaves and hair extensions for you. They vary in length and texture to match your preference and current hairstyle. They have straight hair extensions to give you long and natural looking locks for you to match your existing hairstyle. They likewise have curly and wavy hairstyles to either match your existing hairstyle or if you want to try out a new hairstyle without a commitment. Either way, you can get that full bodied hair in an instant. Check out Rebeccafashion to know more about hair weaves and hair extensions.